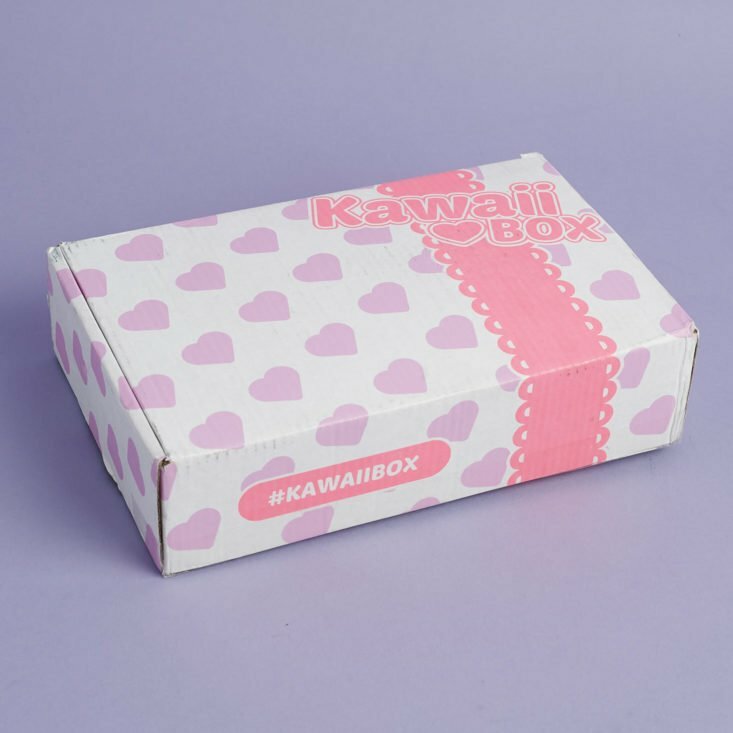 Kawaii Box is a monthly subscription service that sends you cute items from Japan and Korea. Each box includes 10-12 original and licensed kawaii items. The Cost: $24.90 per month + free shipping. Save with 3, 6, and 12-month prepaid subscriptions. Ships to: Everywhere with free shipping! Check out all of our Kawaii Box reviews and the Kawaii Subscription Box Directory! The box comes with a cute card listing the eight items included this month. There’s also a card that mentions that if you share with your friends, you’ll get $5 towards your next order. You can get a free kawaii gift with this a coupon with your next order as well. You can win a Kawaii Megabox by tagging your photos on social media! This little cutie is a pink seal pup wearing a red bow and a big smile on her sweet face. She measures about nine inches long and is super soft and huggable. I used to love baby harp seals in high school and had several photo books of them playing in the snow and general being innocent and adorable. I get the same happy feeling when I look at this chubby lil pup. Usagi is apparently a popular character in Japan, especially on the LINE app that many use for messaging and calls. 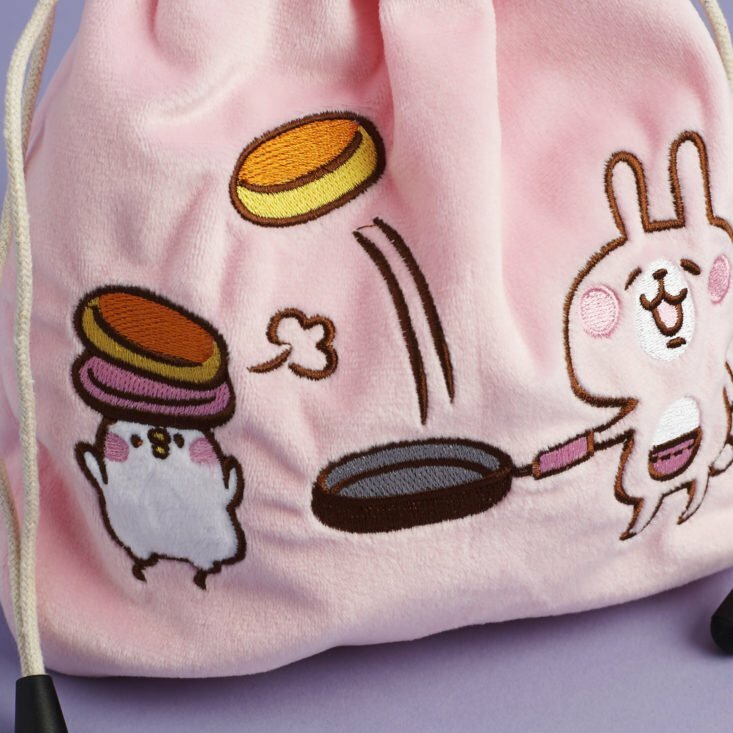 Created by the illustrator Kanahei, this embroidered pink bunny is seen flipping thick Japanese style pancakes onto the head of her bird friend, Piske. The bag is ultra-soft and made from a fabric that is usually used for plush animals. There’s a thick cord with plastic ends that you can use to pull it closed. This would be a cute little travel toiletry bag or to use to tote candies around in! Every time I get a new Gudetama item, I think “this is the cutest one! !”, until the next one comes. This sticker set has our lazy egg friend doing various exercises and it’s making my sides hurt with laughter. I share the exact same disdain for anything that increases my heart rate or distracts me from relaxing and/or eating. He just looks so miserable and I love him for it. These are kind of like Smarties, but ramune soda flavored with fruits and vegetables. These powdery candies taste like carrots, lemon, oranges, and grapes. They are normally sold in a string of 5 packages, but only one came in the box. This pen is a weird one! Out of the four available colors, I received the pink pen body with a white boot which serves as the cap. The boot itself has a bear face on it and a slight heel and the side of the pen reads “Can you keep a secret?” in all caps. The ink flows really nicely from this, though it’s a little top heavy if you have the boot at the end, so I prefer to write with the cap off. There were four versions of this mini notebook as well and I got the one with the girl dressed as Super Mario, complete with mustache! I was just recently playing the NES and SNES minis with friends and it has revived my love of some Nintendo games. My friend Kelly is the biggest Nintendo fan I know, so this small notebook with plastic cover and lined pages will go directly to her. There’s space on the top corner of each page to write the date so that you can use it as a diary or a place to jot down to-do lists. These three small hair clips feature drinks such as bottled water, strawberry milk, and what I am assuming to be banana milk. Strangely enough, I had just had a conversation with my friend Liz in which she talked about liking banana milk and recently purchasing some. It made my stomach churn just thinking of it, so I’m going to gift her these strange little pink plastic clips so she can tell the world of her love of banana milk. With the holidays coming up fast, it’s nice to receive some special decorative stickers that I can include on tags or in cards for my loved ones. These hard plastic jewel stickers come in pink, purple, blue, and silver and will surely bring magical feelings to anything they’re stuck on. These would also be great for scrapbooking or journalling when some glitz is needed. Verdict: Kawaii Box delivered me a super cute box full of eight plush and useful goodies that retails for over $34, for $24.90. The notebook, stickers, and Usagi bag were probably my favorite items, but I’ll make use of the pen and pass the plush onto a friend as well. There are always unique and strange items in this sub that make me smile! Can you still get this box if you sign up today? No. You will always receive the following month’s box of the month you subscribe in. Order by the end of November to receive December’s Box. Value Breakdown: At $24.90 for this box, you are paying approximately $3.11 per item. 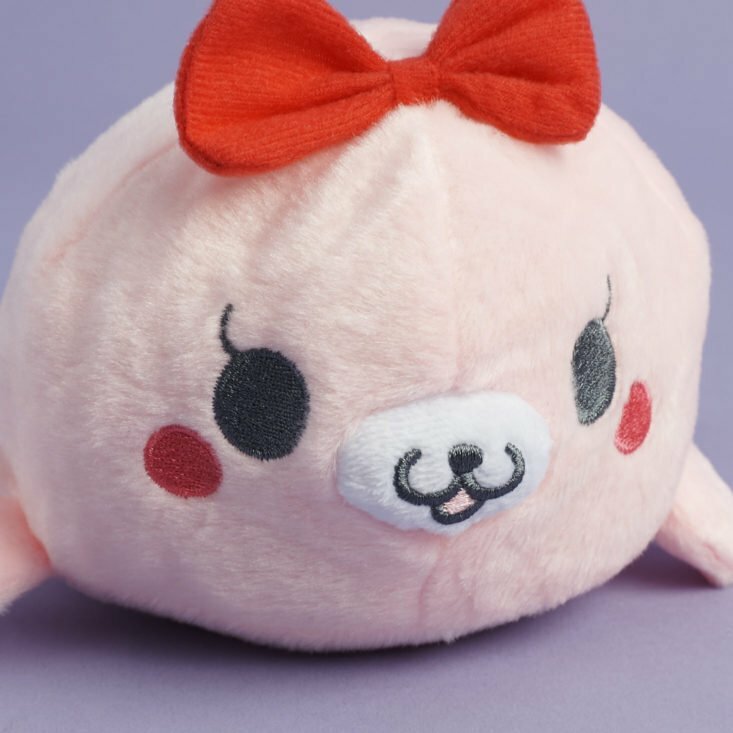 What would you carry in the plush pink bag from Kawaii Box?